J-01 as a flagship shop was opened in 8 August 2008 and celebrated with the launch of multi-brand and Olympics crossover limited edition sneakers. As this shop is located in core shopping mall with world famous brands, the design was based on concept of Olympics, grand and unique. 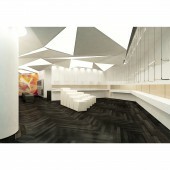 At that time, achieved irregular triangle shaped as featured ceiling is creation desire of our designers. 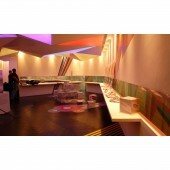 Hence, we chose unconventional material and extraordinary craft technique to create remarkable experiential of the space. Being an unique multi-brand sneakers exhibition showroom and flagship shop, eye catching window display is a design element. By blocking view of eye level at large window, this caused visitors feel comfortable to spend more time in the shop and offered increases opportunities of interest to come closer and visit. In addition, this shop is irregular shaped, concealed and adjustable LED light source at diamond cut ceiling form a visual attraction, flexible and diversification of light reflection. J-01 is a code, mission and locally born and bred brand achievement. This is a space for unique multi-brand sneakers exhibition showroom and retail store. The project started in July 2008 and finished in August 2008, and was opened to the public J-01 was located in IFC, Central, Hong Kong. General lighting is tailor made adjustable-color and dimmable LED screen achieved on 3 dimensional irregular triangle shaped ceiling surface, conventional shanghai plastering wall covering, natural timber floor, major color is creamy white ceiling and wall coating. Owing to our client had various brands of retail stores, our research is to conducting site visits their multi-brand sneakers shops and developing a brand new space. Meanwhile, we explored other ways of creating a diversified ceiling and stylish window display to achieve visual attraction. Our design required more machining, more complex assembly procedures to ensure that is well functional and secure, an ideal solution is to seek traditional craftsman to apply their knowledge on our new design language. Meet tight schedule, accurate calculations, delicate craftsmanship are challenges of this project. As we had only 10 nights for site work in core shopping mall. Hence, accurate drawings, well preparation and good planning are essential. The irregular triangle shaped ceiling were extraordinary in 2008, the technique is also a challenge for craftsman. Accurate technical drawings is required for making modular component at factory, this could reduce actual site work time. Joint Deco, established by David Lok in 1988, is an interior designing company which specialization is commercial organizations such as hair salons, fashions retailers, bars and restaurants. In order to satisfy the various needs of our clients from a variety of fields, we are willing to work with designers and other specialties. We determine to complete every assignment with a perfect team which consists of the most talented and experienced people in the industry. In fact, our "working-with-most-appropriate-partners" theory proves to be successful. We need to understand our clients' needs thoroughly before we can decide the team-in-charge for the particular project among the members of Joint Deco, who each has his own strength. This is the first and important step to our "working-with-most-appropriate-partners" theory. The team will then starts brainstorming and come up with a thematic design - a design that satisfies the needs and budgets of our clients. Our work and progress does not stop here. As the construction starts, we follow through the progress many times and our designers even work on sites. Also we will go visit our clients' shops every now and then to see if there is any room of improvement. 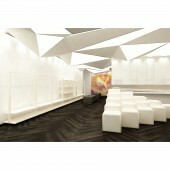 J-01 Retail Sneakers Shops by Joint Deco is a Nominee in Interior Space and Exhibition Design Category. 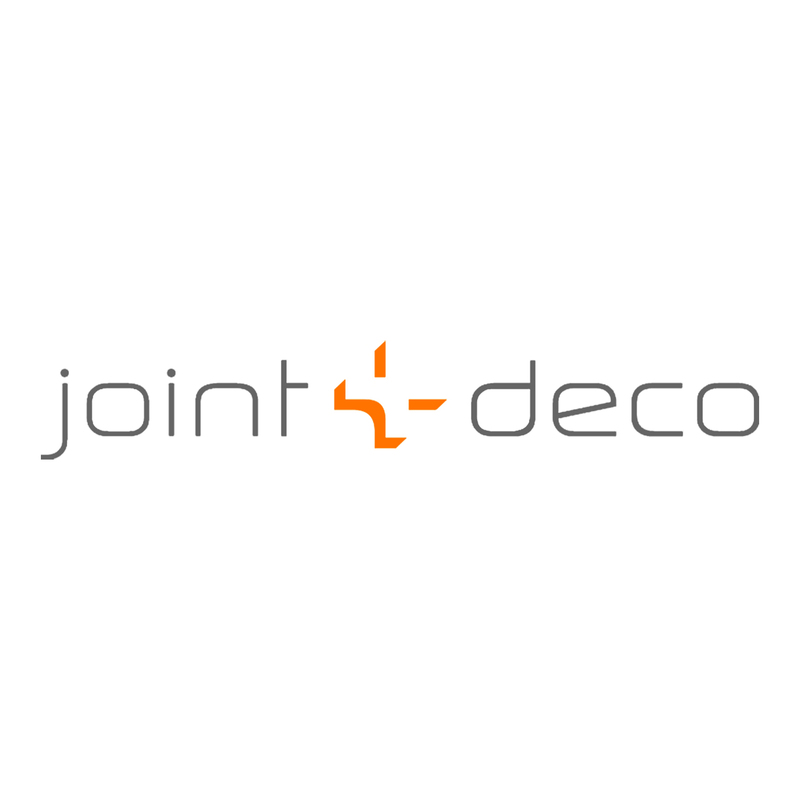 · Click here to register today inorder to be able to view the profile and other works by Joint Deco when results are announced. J-01 Retail Sneakers Shops by Joint Deco is Winner in Interior Space and Exhibition Design Category, 2015 - 2016. · Press Members: Login or Register to request an exclusive interview with Joint Deco. · Click here to register inorder to view the profile and other works by Joint Deco. Did you like Joint Deco's Interior Design? 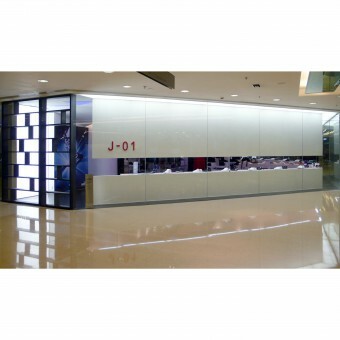 Did you like J-01 Retail Sneakers Shops? Help us create a global awareness for good interior design worldwide. Show your support for Joint Deco, the creator of great interior design by gifting them a nomination ticket so that we could promote more of their great interior designs.